In July 2018 the Mesolithic Resource Group attended the Kierikki Stone Age Centre, Pahkalantie, Finland. The visit provided us with the opportunity to practice experimental archaeology in a ‘Stone Age’ landscape at Kierikki. One project was the reconstruction of a section of the Neolithic wooden fish weir from the site of Purkajasuo, which is on display in the museum. Constructed of pine, willow and birch bark, the section demonstrates the creative use of materials local to the area. We employed an actualistic approach, using technologies and materials available to the inhabitants of the area between 3300-2900BC. Our work demonstrated the effective use of resources by Stone Age societies and reinforced the importance and effectiveness of simple tools. For most of the project we used unmodified tools. Given that one intention of this project was to use locally sourced tools, slate fragments found along the shoreline provided all that was needed. The slate was of a quality which could be either split along the cleavage lines in order to make the thin edges, or was dense enough to use as a larger block. In July 2018, the Mesolithic Resource Group (MRG) attended the Kierikki Stone Age Centre, Pahkalantie, Finland, as part of an educational programme of study. The visit provided us with the opportunity to practice experimental archaeology in a ‘Stone Age’ landscape enhanced by the many reconstructions at the Kierikki centre. During this visit, one of the projects undertaken by the MRG was the construction of a section of the lath screen fish weir discovered in 1995 at the nearby site of Purkajasuo. The Purkajasuo site dates from the Middle Subneolithic, 3934-2681 BC (cal), and was located at the contemporaneous mouth of the Iijoki River (Koivisto and Nurminen, 2015). Excavations in 1996-9 and 2004 revealed not only the extent, approximately 13 hectares, but also the range of worked wood which included; laths, piles, stakes and perforated planks (Koivisto and Nurminen, 2015). 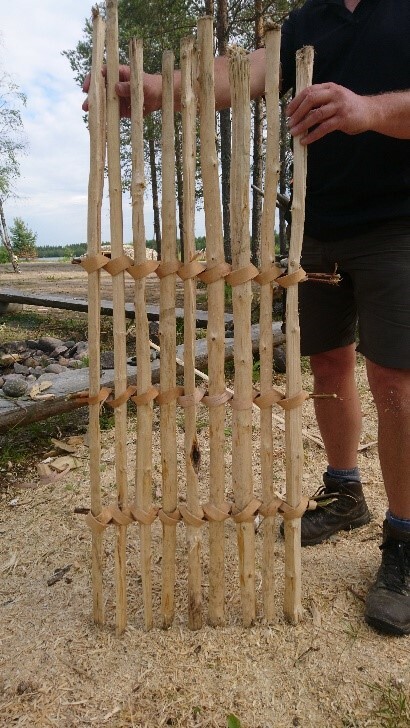 Individual laths comprised the majority of the worked wood (50%) and are thought to be part of screens which would have been used in conjunction with stationary fishing structures such as fish weirs (Koivisto and Nurminen. 2015). Such structures are widespread throughout the wider region (Lozovski and Lozovskaya. 2016), often demonstrating similarities in form and function. Twenty-six lath screen sections were recovered from the site (Koivisto and Nurminen. 2015), and one is on display in the museum at Kierrikki Stone Age Centre. The section is constructed of split pine (Pinus sp.) for the upright laths, willow (Salix sp.) used for the cross-rods, and birch bark (Betula sp.) used for the bindings. The laths are circa 114 cm in length and 3-4 cm wide. The willow cross-rods are circa 5-10 mm diameter at their widest, while the birch bark bindings are circa 2-3 cm wide. The lath screen section on display demonstrates the creative use of materials localised to the area between 3934-2681 cal BC (See Figure 1). There have been several previous reconstructions of weir sections and fish traps local to Kierikki; for example, a video in the museum shows the building of a fish trap, however, metal axes are used throughout. Koivisto and Nurminen (2015) documented that in traditional fisheries which used similar lath screens, the best pine trees for the construction of the laths were found by bogs, wetlands, and coastal flats. These growing conditions produced straight, slow-growing trees with few branches. Suitable trunks were collected in winter, and taken indoors before being dried and processed (Koivisto and Nurminen. 2015). This mirrors the archaeological evidence from Purkajasuo. However, we had less time – three days in the height of summer. Key to the reconstruction of the section on display at the Kierikki museum was the use of an ancient technology approach, using technologies and materials available to the inhabitants of the Purkajasuo area between 3934-2681 cal BC. All three participants have a good skills-set, combined with sound environmental knowledge. We were therefore able to quickly identify a potential procurement, processing and manufacturing strategy to complete the challenge in the time given. Evon Kirby and James Findlay conducted the practical elements of the project. The timings of activities were monitored throughout, and data was recorded, as were notes and observations (See Table 1). The plant materials used reflect those of the original; pine, willow, birch. Stone tools were used, however these consisted of mainly unmodified pieces of slate which were found on the ground along the shoreline. Therefore, all materials were located on site, many of them in the work area. For times - see Table 1. Table 1. Timings of activities, notes and observations. To recreate the section of lath screen that is on display in the Kierikkimuseum, several pines that were growing in the bog were selected. Trees chosen were circa 4 m in height and circa 7-10 cm diameter at the base. These dimensions meant that the trees could be manually pulled over (See Figure 2), twisted and snapped from the stump, thereby avoiding the necessity of cutting and the need for any specialist tools. Three trees were felled in this manner in 10 minutes and all were processed in the following manner. Side branches were removed by twisting and snapping by hand (See Figure 3a). The pine laths in the Purkajasuo section had no bark, therefore debarking was required. This was accomplished using an unmodified thin piece of slate that was employed in a similar manner to a skinning knife (See Figure 3b) and took 120 minutes (40 minutes per tree). The stripped pines were cut to the desired lengths using a piece of slate, which had been modified by using another piece of slate to create a serrated edge, thus acting as a rudimentary saw. Rather than sawing through the pine from side to side, a shallow (circa 6 mm) cut was made around the circumference of the tree creating a weak point. When the cut was complete the tree was snapped at this weak point (See Figure 4), this process took 10 minutes per section. Figure 5 displays the snapped pine section, illustrating the scoring made by the modified slate tool, and the snapped fibres. The pine laths in the Purkajasuo section appeared to have been split rather than being used ‘in the round’. Our pine sections were split by using simple small unmodified pieces of slate as wedges. The slate ‘wedges’ were held at one end of the section of pine then tapped into the end grain using the waste tip of one of the trees (See Figure 6). Once the split, running central to the pine section, had reached half way, a riving (splitting) stick was used. This was manufactured from a waste tip of a pine tree, at the top of the tip a ‘triangle’ wedge shape was cut, again using an unmodified slate tool (See Figure 7). The riving stick was then driven into the ground using the waste tip from one of the stripped pines (See Figure 8a). The open split in the pine section was then placed on either side of the triangular shaped head of the riving stick and the section was pushed against it. The triangular shape forced the wood apart resulting in a nice clean split (See Figure 8). This whole process took 30 minutes (180 minutes in total). The final step in the processing and manufacture of the pine laths was to shape them. Unmodified slate tools again proved effective for this (See Figure 9). This took 60 minutes in total. The original lath screen section incorporated thin strips of willow circa 5-10 mm in diameter and bindings of birch bark. Both were collected in 5 minutes from the Kierrikki site. Throughout these procurement and processing stages, all work was completed by Evon Kirby and James Findlay. The total time for procurement of materials was 20 minutes while the total time for manufacturing the various elements of the section was 440 minutes (seven and half hours). With all the materials now ready for assembly, the construction of the section was left to Evon Kirby. The laths were propped up against a log bench to facilitate easier access during the binding process (See Figure 10a). The willow rods were held against the pine laths and the birch bark lashing was bound in either an ‘X’ pattern or a simple wrap (See Figure 10b) as observed in the original. To increase the suppleness of the lashings, the birch bark was heated over a wood fire which caused the bark to curl, which allowed the bark to better retain its shape during binding. On completion, the section was light, yet sturdy and slightly flexible, due to the integration of the groups of willow rods. The total time for the construction phase of the lath screen weir section was 30 minutes. Therefore, the total construction time was 490 minutes (eight hours and ten minutes). Given that one intention of this project was to use locally sourced tools, slate fragments found along the shoreline provided all that was needed. The slate was of a quality which could be either split along the cleavage lines in order to make the thin edges illustrated in Figure 3 right, Figure 4 and Figure 6, or was dense enough to use as a larger block, as in Figures 7 and 9. During construction, it was observed that a piece of slate might only be used for one task before being discarded. Obviously, if we were making many lath screens then the tools will have become modified by frequent application, which would make it easier for a future archaeologist to detect usewear. This project served to illustrate several points. Primarily, it demonstrated the effective use of resources by Stone Age societies, particularly the ingenious use of groups of thin willow rods to act as a flexible support rather than using a single thicker rod. We found that pulling over pines in the damp areas meant that no axes or specialist tools were required. Furthermore, it reinforced the importance and effectiveness of simple, often expedient tools in the creation of something, in this case a project requiring a level of green woodworking skills. For most of the project we used unmodified tools which were found along the shoreline, when a specific tool was required e.g. the saw, this was simply and quickly modified. Of course, as in any experiment, the project also generated questions. Such as why were the pine laths flat and lacking bark? We suggest that it was because the birch bark bindings adhere better when holding something that is debarked and flat. Similarly, why were the willow rods not debarked? Particularly as lashings or cord could have been made from the bast and the rods could still have been used for the pine lath supports. Ultimately, projects such as these emphasise how skilled people can create things in a reasonable amount of time even with limited stone tool resources. It also underlines how fundamental a knowledge of the environment and natural history is when working with Prehistoric contexts of organic material usage. We would like to thank the following for their help and support throughout the project; Leena Lehtinen, Director of Kierikki Stone Age Centre; Sami Viljanmaa Curator of Education at Kierikki Stone Age Centre; Joanne Stamper of GRAMPUS Heritage and Training Limited; and the EU Erasmus + scheme. Koivisto, S. and Nurminen, K. 2015. Go with the flow: Stationary wooden fishing structures and the significance of estuary fishing in Subneolithic Finland. Fennoscandia archaeologica, XXXII, pp.55-77. Lozovsky, V.M. and Lozovskaya, O.V. 2016. New evidence of the fishing economy of Stone Age waterlogged sites in central and north-western Russia: the example of Zamostje 2. In: P. Uino and K. Nordqvist, eds. 2016. New Sites, New Methods. Proceedings of the Finnish-Russian Archaeological Symposium. Helsinki 2014. ISKOS 21. Helsinki: The Finnish Antiquarian Society. pp.85-100.